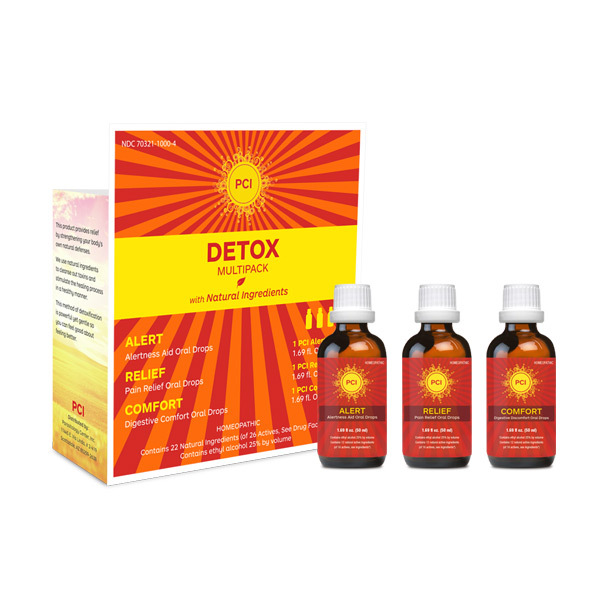 The PCI Detox package is a homeopathic liquid remedy designed for drainage and detoxification from internal toxins affecting the internal organ systems. It is the first and most potent line of defense against toxic chemicals that restores normal balanced immune functions. Active Ingredients: Berberis Vulgaris 2X, 10X, 30X, 200X (0.2 ml). Colocynthis 3X (1.5 ml), 10X, 30X, 200X (0.15 ml each). Veratrum Album 3X, 10X, 30X, 200X (0.15 ml). Aranea Diadema 6X (2.5 ml). Calcarea Phosphorica 12X (2.5 ml). Equisetum Hyemale 4X (2.5 ml). Ferrum Iodatum 12X (5 ml). Fumaria Officinalis 4X (2.5 ml). Gentiana Lutea 5X (2.5 ml). Geranium Robertianum 4X (5 ml). Levothyroxine 12X (2.5 ml). Myosotis Arvensis 3X (2.5 ml). Nasturtium Aquaticum 4X (5 ml). Natrum Sulphuricum 4X (2.5 ml). Pinus Sylvestris 4X (2.5 ml). Sarsaparilla 6X (2.5 ml). Scrophularia Nodosa 3X (2.5 ml). Teucrim Scorodonia 3X (2.5 ml). Veronica Officinalis 3X (2.5 ml). Bryonia Alba 3X, 6X, 10X, 15X, 30X, 200X, 1000X (0.1 ml Each). Colocynthis 3X, 10X, 30X, 200X (0.15 ml Each). Lycopodium Clavatum 3X, 10X, 30X, 200X, 1000X (0.15 ml Each). Nux Vomica 3X, 10X, 15X, 30X, 200X, 1000X (0.1 ml Each). Inactive Ingredients: Ethyl Alcohol, Purified Water USP.